Oct 13 2008 - Construction Started on New Layout! Hooray! I finally started construction on the new Donner Summit layout! 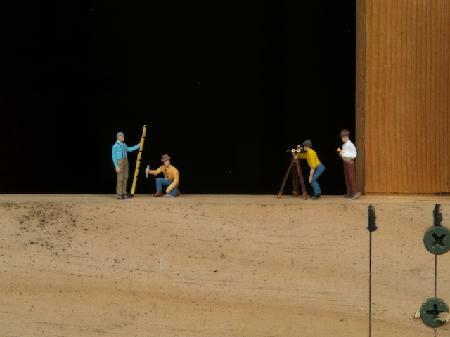 To the left you can see the surveying crew busy at work figuring out where to place the next beam. Blog entries have been slow lately due to the delay of painting and restoring the layout shed. I replaced a lot of dry rotted wood, added new flashing, fixed a number of leaks in the roof, cleaned and painted the exterior. I also snuck a business ttrip to Europe in there. Still planned is a deck in front of the building for people to lounge on and to put my table-saw and planer on during construction projects. I have started building the staging basement level. I need to finish it to the stage of operating track-work as it will be hard to get to once the next level is put on due to low clearance. I have bought all the switches (Atlas #6 for economy) and flex-track (Atlas Code 100) and should be laying it next week. After that I will build the helix and start the lower level. Keep you posted! Hopefully it won't be so long until my next post. 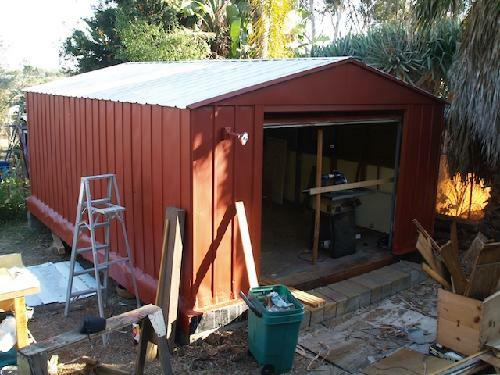 The newly restored and painted workshop metal shed - site of the new layout.